As one of the more under-recognized labels releasing excellent creative jazz, it’s somehow fitting that Jazzwerkstatt has been one of the chief outlets for the work of chronically under-recognized saxophonist/clarinetist Silke Eberhard. Her Potsa Lotsa project dedicated to revisiting the work of Eric Dolphy has perhaps been her most noteworthy endeavor for the label, but she’s had a number of other dates that are also worthy of serious engagement by those who love adventurous jazz with a strong rhythmic and lyrical core. Jazzwerkstatt has packaged two of those here, along with her Potsa Lotsa disc, in a discounted three-CD box set that offers a splendid overview of much of Eberhard’s work during the past decade. Unlike other box sets released by the label, some of which don’t always have a discernible logic , this one’s perfectly curated, as it covers three different dimensions of Eberhard’s music. The first disc is her freebop trio outing from 2011, What a Beauty Being, with bassist Jan Roder and drummer Kay Lübke. This was actually her second recorded date with this trio, the first, Being, coming in 2008 , and the musicians clearly draw on their experience together in making music that is relentlessly creative and highly communicative. And there is indeed a lot of beauty in the music, as the fluidity and chance-taking of the trio is always in service of exploring the melodic essence at the center of each piece. 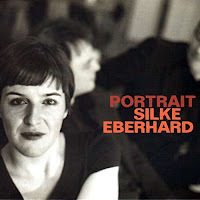 There’s typically very little meandering in Eberhard’s music: she likes relatively short tracks that offer potent, invigorating bursts of improvisation and groove, with just enough room for each of the musicians to have space to develop ideas independently and collectively. The Roder-Lübke tandem is lithe and nimble, able to stay nicely in sync while at the same time leaving opportunities for loosening the tether. Eberhard sticks to alto sax here, even though she’s equally adept on the clarinet—but she’s still able to display plenty of range to her music on the disc, whether it’s the rapid-fire boppish flourishes she offers on “Da wo’s schön ist,” the oblique concept she brings to “Jetzt und hier,” or her aggressive upper-register careening on “Tischtennis.” One never gets the sense that Eberhard is over-reaching, as she hews closely to the purpose of each piece. But this is not to suggest that there’s anything “safe” about this music: just listen to the way the group turns it loose at the end of the feisty “Es riecht nach vollem Haus,” with a powerful intensity that is sure to get the blood pumping. There’s no question that Eberhard excels in a trio format, as it offers her the perfect balance of structure and freedom—something amply demonstrated on her wonderful Mingus tribute disc, Mingus, Mingus, Mingus, from 2016 (with trumpeter Nikolaus Neuser and drummer Christian Marian). What a Beauty Being is optimal in showcasing her ability to forge a close rapport with her partners and to create music that is both eminently listenable and boldly spirited. The second disc is Darlingtonia, Eberhard’s live duo performance from 2010 with pianist Dave Burrell, and it represents even more of a musical conversation, as the music is both freely improvised and highly sympathetic. Eberhard responds deftly to Burrell’s feints and jabs, but the intimacy of the format also brings out her more lyrical side, as she can explore a softer emotional sensibility on the languid stretches of the record’s opener, “Lytta Vesicatoria,” with just a few spare chords from Burrell for support. With room to stretch out, Eberhard takes full advantage of the opportunity to develop her ideas with greater leisure, and she’s quite eager throughout to engage Burrell, who in turn offers her plenty of ideas of his own. The dance-like cadence Burrell establishes on “Meloidae” gives Eberhard an opening to carve out some playful space, and the two have some terrific upper-register interaction midway through “Liloceris Lil Il.” The delicate grace of “Harmonia Axyridis” reveals the remarkable patience and sensitivity of both players. But the whole disc is characterized by an unmistakable mutuality, nowhere more evident than the 14-minute extravaganza “Rhynocoris Iracundus,” in which Burrell is at his Monk-like best, throwing out de-centered figures in flurries, inviting Eberhard to join in, and when she does the effect is exhilarating, with the duo possessed by a boundless energy. The box is rounded out by Potsa Lots Plus – Plays Love Suite by Eric Dolphy, and since it has been reviewed previously here, there’s no need to repeat that coverage, except to say that when compared to the first two discs, this one really allows for an appreciation of Eberhard’s skill as an arranger. Using a larger septet format, her ability to utilize the diverse voicings at her disposal allows her to do homage to Dolphy without simply imitating him. The result has all the vitality of Dolphy, but by employing electronics and fostering some terrific group interaction, Eberhard ultimately makes the music all her own. All in all, a very fine collection of music, and an ideal introduction to Eberhard’s work for those who’ve yet to encounter her.